Well, I finally did that tutorial for you! Although I must extend my apologies immediately, because my dear little Christmas tree cake morphed into a 2nd Birthday Cake for my little girl. I do hope you can still get the general idea of how it all comes about! First, start off by baking your cake. I like a sturdy white cake, and this recipe has done me well. Since we were actually planning on eating this cake, I wanted to make it an appropriate size for our family, so I used a 6in. pan. This left me plenty of batter to make some pink and purple cupcakes, my little girls favorite colors. 1. Place your cake on your stand. 2. Find something that will give you a circle imprint on your cake. 3. Trace around it so you know where you are carving. Do this on both sides of your cake. Carve out a half circle. This will be one half of the ornament we are putting inside. Cut out a tiny dot for the tippy top of the ornament. I went ahead and cut through all the way to the cake stand. This will actually help me to remember which layer goes on top! Start adding your cake ball mixture, and be mindful of the edges. We are going for straight lines in our ornament, so I also used a glass to help me get a uniformly straight line. Alternate your colors (you can use as many or as few colors as you want!) until both layers of cake are level. Flip your ‘top’ layer on to your bottom layer and do a quick crumb coat. Since this is going to be a ruffle cake, your crumb coat does not have to be perfect in the slightest! And now for a SPECIAL treat… a ruffle tutorial! Hope you dont mind, but this technique is so fun and easy I couldnt resist sharing! Martha recommends using a #103 tip. I think you can easily use a #102 or a #104 as well, and I did end up using a #102 for this cake. This tip has a small opening and a larger one on the opposite end. Make sure the SMALL end of the tip is facing out and the larger end of the tip is touching the cake (slightly) as you pipe. The technique itself is simple, just choose how wide you want your ruffle, then pipe back and forth… going left to right all the way up the side of the cake. I would take a step back from the cake every three or four rows, just to make sure your rows are straight! You can also make straight lines up the side of the crumb coat to help you keep upright all the way around your cake. This ornament is definitely one of my favorites. It lends itself beautifully to any color or design… I cant wait to see what fun I will have with it next year! 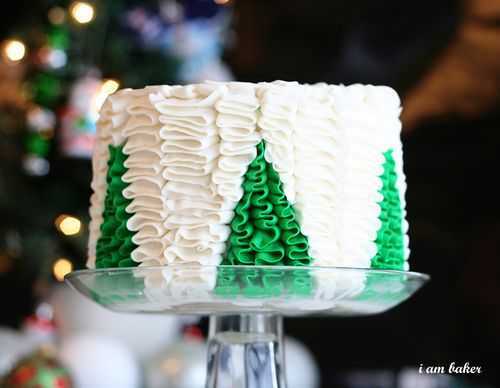 I hope you will try the Ruffle/Ornament cake. And if you do, be sure to let me know! Love the look of the ruffles…don’t think I am ready to tackle the wonderful designs inside. Thank you for sharing with everyone. Did you make two 6in cakes or one and cut it in half? WOW! Another amazing cake from you, they just get better and better. So lovely! 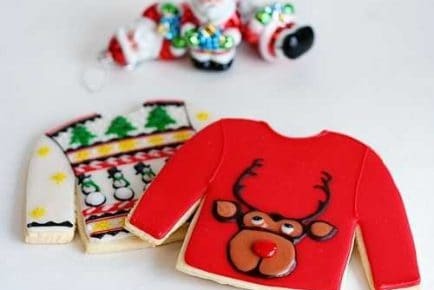 Question, what type of icing did you use? I’ve been reading that a SWBC is best but I really don’t like it unfortunately so I wondered if you perhaps used something else? Thanks in advance! Love your site! Thank you so much for such a great tutorial! ..the cake looks fabulous, i just love it!! I loved this cake so much I had to try it but instead of the ornament I did an angel. My sister-in-law likes angels so I made her a birthday cake with and angel in the middle. It is not great but is a good first try. I wanted to show you a picture but do not know how to get one to you. Thank you for sharing your talent. I love your tutorials. I would LOVE to share this on my “Friday Link” roundup. OK to steal a photo with proper credit? I think my fans will love this (as much as I do). Thanks Amanda! I was actually trying to find a cake idea for New Years Eve with my little daughter’s since we are having a movie marathon and the girls have picked a list of board games and video games they asked me and daddy play with them tonight so I am going to use the same color palate and for the top try to add 2013? Not sure how the top will turn out yet but I am so excited to try this pretty little cake! Happy New Year to you and yours and cannot wait for more baby updates from you. When you say you put four cupcakes in a bowl do you mean you baked cupcakes that were tinted pink and purple? Even after looking at the pictures I am not sure what the ‘cupcakes’ are made of???? ?